Painter’s Servant has been the fuel for unpleasant combos, most notably with Grindstone and Iona, Shield of Emeria. The latter two cards occupy some interesting design/deckbuilding space, so we’d like to see them in the format. Swapping Grindstone/Painter’s Servant seemed like a natural fit to bring back a decent card and get rid of the true offender. Truthfully, this was only a matter of time. Painter’s Servant is a broken card when it’s mixed with a few certain cards (Grindstone, Iona, Chaotic Backlash, Jaya), and there are still plenty of ways to effect the color of cards that are on the battlefield. That’s the reason Painter’s Servant was so good, it hit everything else that wasn’t in play. I had dabbled in a Iona/Servant deck and had seen people run it in combination with Tooth and Nail, which ended multiplayer games right there. Grindstone can come back to help hose mono-color decks, though less effectively. These bannings take effect December 20th. Changes to the Banned List have been made. This entry was posted on Thursday, December 3rd, 2009 at 11:05 pm	and posted in EDH, Magic: the Gathering. You can follow any responses to this entry through the RSS 2.0 feed. I am a little unimpressed and a little miffed with this banning, partly because Jaya and Teysa are two of my generals. To be frank, Painter’s Servant was banned only because of Iona – no one had a problem with the Servant before Iona came out. There are tons of zany little EDH combos with the Servant – that’s why he was fun. Jaya? Chaotic Backlash? 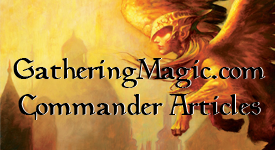 These are EDH combos: fragile and tenous, and utterly amazing when they happen. Even Teysa needs a buttload of cards to properly go off. These combos, in my opinion, should be celebrated! Lame combos like Erayo + Arcane Lab, on the other hand, are just douchebag-esque. Banning Servant won’t stop people from playing Iona, who is still oppressive to both mono and multi-coloured decks, and who can be easily abused with recursion. And at $25 a pop, are people really going to start playing Grindstone again without its partner in crime? As a “well-maybe-they’ll-make-another-Iona-like-card-in-the-future” banning at the expense of every other card interaction with Painter’s Servant, and as the first banning I’ve experienced since starting EDH, I’m not too happy with this. No need to apologize. Yes, bannings sometimes piss people off who have found fun, creative and “safe” uses for the banned cards. Would Lotus Petal have been fine way back when if there was no Tolarian Academy? Yes, since the artifact is still legal in Legacy but the legendary land isn’t. Remember, these bannings are suggestions and if your playgroup can still play with whatever cards they want to allow or ban. The suggested ban list is for if you go to a new area and play against new people as then they would be most likely following this list as well. If they aren’t, but you follow this list, they really can’t get mad at the new player. I’ll throw this up at a later time as an article though. And sorry Derfington, I’ve already made editor’s comments about your Jaya article. Don’t want kids to get the wrong impression. No worries MCP – it may be a good time to update the list with more recent additions, at any rate. I have to agree with Derfington. I am not too crazy about this choice overall. Iona certainly is a total hoser against mono color decks. I fail to see how shutting out your opponent is good in what is supposed to be a fun, casual format. I personally would rather see the servant still in, grind stone stay out, and Iona get the boot too.